Bill Gates yesterday claimed he had paid too little tax and did not deserve to be so rich. The 63-year-old, who is worth around £73billion, said he and other business barons should have to contribute more. The father-of-three made his fortune after founding Microsoft in 1975. It is now one of the world’s most valuable companies. Mr Gates, who stepped back from his day-to-day role in 2008, is one of a handful of billionaires who have promised to leave most of their fortunes to good causes rather than to their children. With his 54-year-old wife he runs the Bill & Melinda Gates Foundation, which is dedicated to tackling poverty and disease in poorer countries. The couple were first spurred into philanthropy after reading in a newspaper about hundreds of thousands of children dying of diarrhoea in poor parts of the world. Since then global health schemes – with help from governments and charities such as their foundation – have helped save millions of lives that would otherwise have been lost to diseases such as HIV, tuberculosis and malaria. Mr Gates claimed these schemes were under threat. In his letter, he said: ‘I worry that wealthy countries are turning inward and will take such a limited view of their own self-interest that they’ll decide these efforts aren’t worth the cost. Mrs Gates added: ‘Strengthening health systems overseas decreases the chance of a deadly pathogen like ebola becoming a global epidemic. ‘And ensuring every parent everywhere has the opportunity to raise safe, educated, healthy kids makes it less likely they will embark on desperate journeys to seek better lives elsewhere. The UK Government teamed up with the Gates Foundation in 2016 to commit £3billion to fighting malaria. 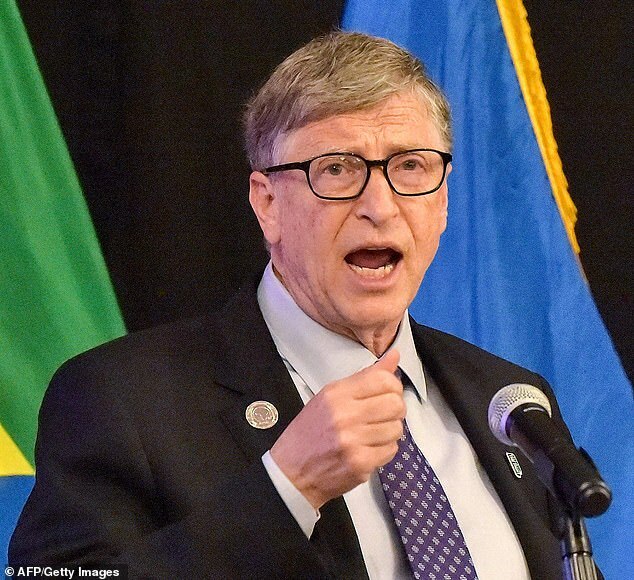 Mr Gates said other organisations that would need further funding this year and next include the Global Fund to Fight AIDS, Tuberculosis and Malaria, and Gavi, which improves access to vaccines among children in poor countries. In their letter, the couple also called for the collection of better data on women’s lives in developing countries. They also said action was needed to cut carbon emissions.